Ce matin, nous nous sommes rencontres a 9h30 a shinjuku pour prendre le bus. Il y avait des personnes qui avait deja assisste a ce camp aussi bien que des personnes dont c’etait la premiere fois mais nous nous entendions tous bien et en fin de compte nous etions tous amis . C’etait une route tres agreable avec une bonne ambiance. This morning, at 9 o’clock we all gathered in Shinjuku and got on the bus to leave for Namiai. 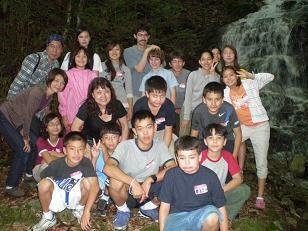 There were kids that had been to Namiai Camp before and kids that were new to Namiai Camp. At first everyone was too scared to talk to anyone but soon everyone was talking and making friends. Quand nous sommes arrives a namiai, nous nous sommes tous presentes en utilisant une carte pour montrer d’ou l’on venait. Nous avons joue a des jeux pour apprendre les prenoms des autres, puis nous avons fait la visite du “Yuugakukan” . Cet endroit est beaucoup plus grand que ce que l’on croirerait dans les photos. Apres tout cela nous avons ecri chacun notre profil et un petit panneau pour notre chambre. 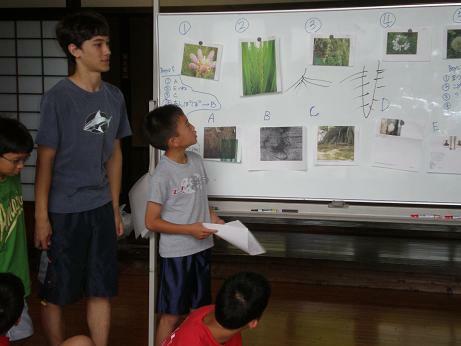 When we reached Namiai, we introduced ourselves by using the map to tell where we lived. 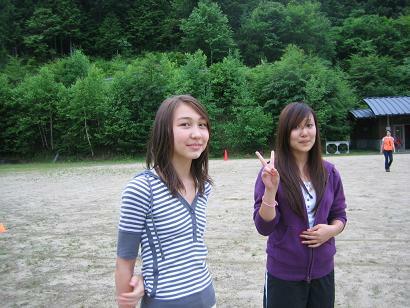 We played a game and went exploring in Yuugakukan. I saw pictures of Namiai through internet before but it was bigger than I thought when I explored. 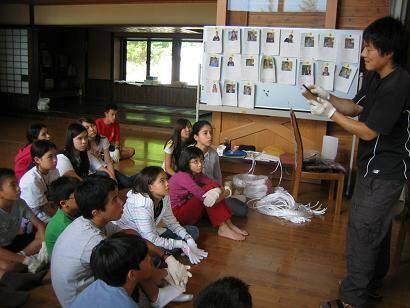 After that, we wrote our profile and make room name tags to prepare for the camp. Le soir vers 6h nous sommes alles au “centre” ou il y a des enfants qui restent a namiai pendant 1an, et nous nous sommes presentes pour une duexieme fois avant d’avoir manger le delicieux riz au curry. Ensuite nous avons joue au jeu de l’ours. C’etait un peu une melange du jeu de telephone et le jeu de reaction. C’etait un jeu bizarre mais amusant a la fois. Nous esperons tous passer un bon moment ici a namiai. 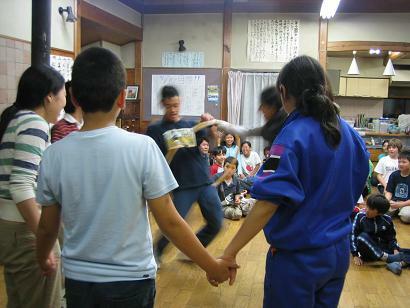 We went to see the kids from center. After we introduced ourselves, we ate good curry. We played with a bear game after that. The game is “message reaction” game. It was a funny game. I’ll try our best next 4 weeks. Today we started off with Radio Taisou (morning exercise). 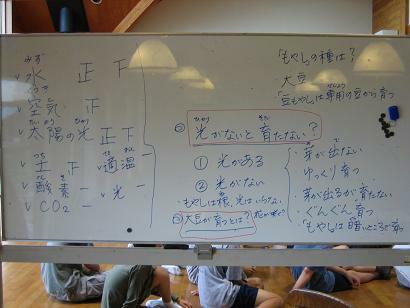 We did not have any volunteer so Yoshio sensei leaded us and we just copied him. We started with stamping feet and then stretched our bodies. 15 minutes later, we sat and ate breakfast. For snack time, we ate Dorian chips and PRETZ larb, which is from Thailand. Both of them tasted good. 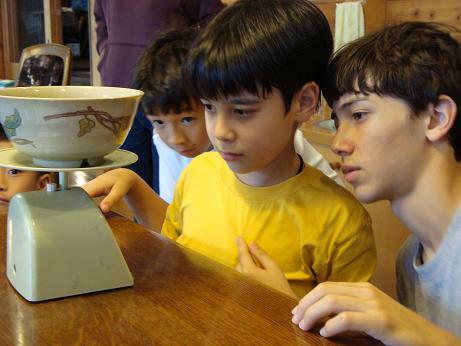 In the afternoon, Chazuke came to help us making chopsticks. 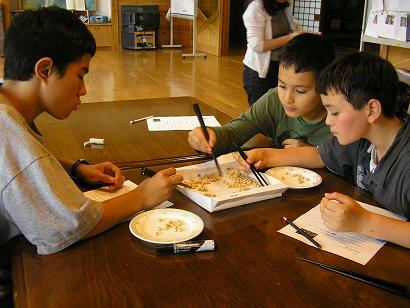 At making chopsticks, we used sandpaper to make the shape of the chopsticks. 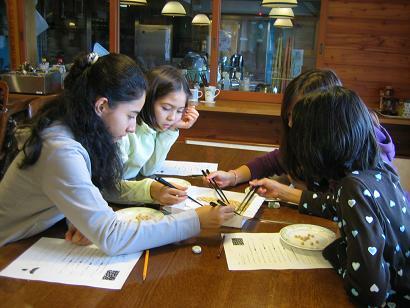 After we made our chopsticks, we used a hot pen to put our name on the chopsticks. We cleaned up and said thank you to Chazuke. 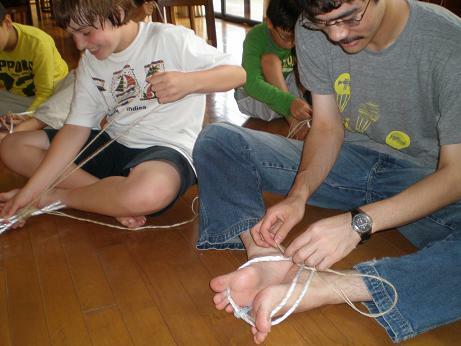 After making the chopsticks, we started to make zouri out of hemp twine. The teacher told the instructions. Some people knew what to do but some people didn’t. 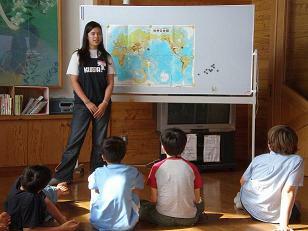 The teacher came around to help us so everybody got started. People went half way and some people went more. 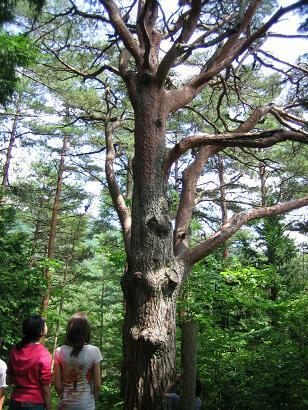 Before lunch, a few of the campers, accompanied by Oyama and Maki sensei, went to see the `Kami no Matsu,` the pine tree of spirits. Ｗe trekked through a dense forest, crossing many small, wooden bridges. I fell on one of them. 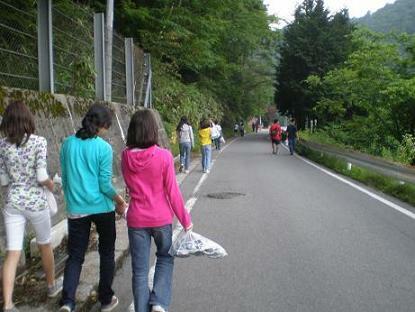 The `Kami no Matsu` was at the top of a mountain, so when we arrived we were very tired. The mountain landscape was breathtaking. Everyone took a lot of pictures. On the way back, we picked and ate raspberries. It was a fun journey. Today, we did the morning exercise. After the exercise we ate breakfast. When we finished breakfast we started to clean yugakukan. Boys1 cleaned the bathrooms. We boys2 cleaned *** and mirror. It was easier than we thought. Boys3 cleaned the bathtubs. Boys4 cleaned the second floor with the vacuums cleaner. Girls1 and 3 washed the dishes and cups. Girls 2 and 3 put the shoes in order at the entrance hall. We thought it became cleaner. It’s hard to believe that we’ve only been at this camp three days since there’s so much to do! I’m finally getting used to waking up really early and going to bed at 10:00, and everyone is very amiable, so there are no worries as far as making friends goes. As a part of the “food” theme, we dealt a lot with soybeans today, first playing games like trying to see how many beans we could pick up with our chopsticks in 2 minutes and predicting their length, and then moving on to discuss what sorts of things soybeans need in order to grow. We all had completely different ideas. Some of us thought that the beans require light, air, and soil, while others suggested that perhaps the beans themselves can in fact do without such conditions. 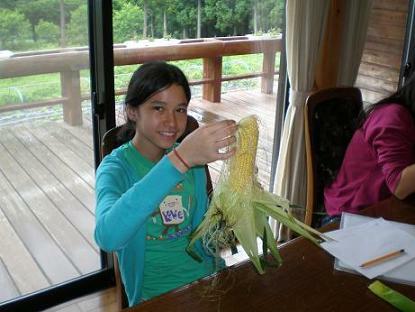 Which brought us to a key question: what exactly do soybeans grow into? This wasn’t something I’d actually thought about very much in the past - I just enjoy eating them - so I was really surprised to learn that soybeans become the “edamame” I’m so familiar with! It just goes to show that there’s really so much more to the stuff we ingest every day than just taste. 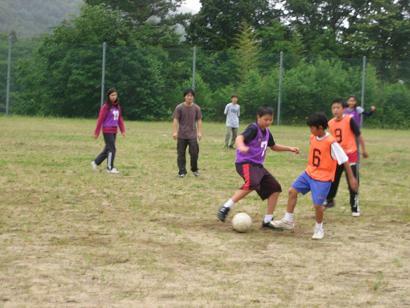 Today, we also got to join the kids at the “Namiai Sports Club.” We played some various tag games as well as a sort of soccer tournament, and although it was raining a bit, it was a lot of fun. We’ll get a chance play with the kids in the “club” next week too, so I’m looking forward to that. We all enjoy playing “freeze tag” during our unoccupied hours, and there was certainly enough of that to go around today! 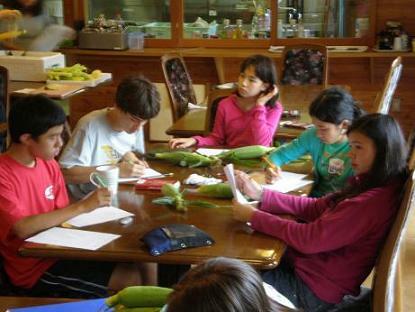 Today I went to visit Namiai School. We took 45 minutes to get there walking. This school that I visited was bigger than my school in Paris. In this school you had to remove your shoes and put slippers or your new shoes that you brought with you. This school had tennis courts, not like in Paris. They both have a playground where kids go play. I was surprised since I saw a chicken near the building inside the school. They had an enormous gym with six hoops. They also have a swimming pool. In my school in Paris there is no swimming pool. 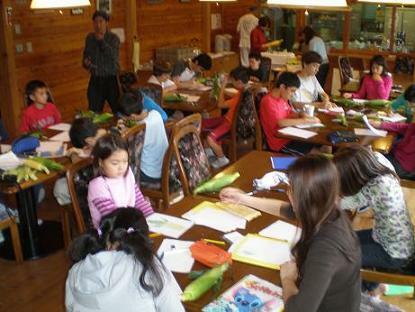 In Paris there is a limited space so that the school could not afford larger facilities. Both schools here and in Paris have uniform except for sometimes when there is a dress down day. We went to “Center” to eat dinner tonight. 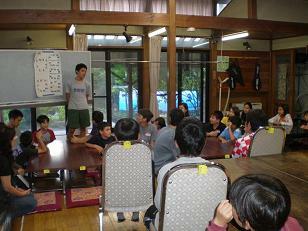 It was really fun to talk and play with kids from Center and Namiai Camp. The dinner was mabodofu-don and croquette. For dessert, we had puddings. We also played a game using Hula-Hoop. We held hands and each member of the group had to pass through the hula-hoop. There were seven people in my team and it took us for 20 seconds. It was pretty hard. After playing the game, we all went back to Yugakukan. 最後の日　川遊び＆スイカ割り：Last Day Going to the river and cracking watermelons!